Great games for new players. This is the second blogpost in a series of posts in which the Irish Games Association will discuss a variety of different gaming related topics. These posts will range from reviews of games to discussions about recent IGA events. In this blogpost, I am going to talk about some tabletop games which I have effectively used in the past to introduce people to the boardgaming hobby. In recent years the board game industry has exploded in popularity! These are three board games which have been seen as the primary gateway games; games which are simple to learn, fun to play and include game mechanics which are used a variety of other very popular games. This trinity of gateway games are Carcassonne, Settlers of Catan and Ticket to Ride. I’m not going to write about these games in this blog post (the internet is full of great posts about why this games are perfect for introducing people to the hobby) but I will instead focus on three other games which I believe are fantastic for introducing people to our wonderful hobby while not necessarily being the first games an aspiring gamer might add to their burgeoning collection. While formulating this list I have focused on four primary things; ease of play, ease of setup, game length and replayability. In the end I have picked three games which I believe are excellent games which can be used to introduce people to board games in various social settings (such as the pub or a lunch break) without being boring for an experienced gamer to play. It’s important to note that this list consists only of the games that I have had experience in using to introduce people to tabletop boardgaming. I’m excited to hear about other games which others may have used in the past. Zombie Dice is a quick and simple game published by Steve Jackson Games for two or more player which takes 10 – 20 minutes to play. Players take turns to randomly draw three dice from a zombie covered container and roll them. These dice can either show brains (which represent victims the zombified player have successfully caught and eaten), footprints (which represent victims who successfully ran away from the player) or shotgun blasts (which represent victims who shot the player). There are three different coloured types of dice (green, yellow and red) with green dice having fewer shotgun blasts than red dice. Players can bank brains between turns unless they roll three shotguns in which case they lose every brain they acquired that turn and must wait till their next turn. 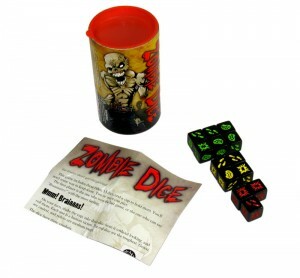 Zombie dice is a classic push your luck game which requires zero setup. The rules can be explained by simply taking the first turn and describing what you are doing to the other players. It’s a game which can be enjoyed when it isn’t your turn by trying to convince the other players to make poorly thought out risks on their turns. It works exceptionally well in a loud environment such as a pub or restaurant and there is no upper limit on player count. Like most other games though, I wouldn’t incorporate any of the games expansions when using it to introduce people to boardgames. 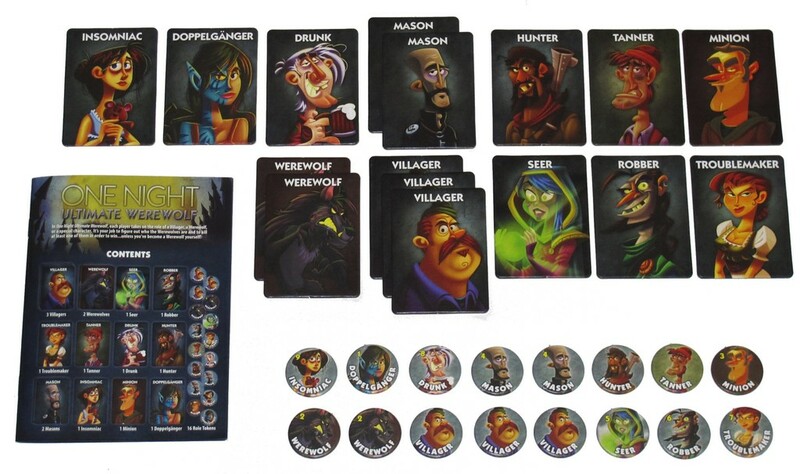 One Night Ultimate Werewolf is a fast paced bluffing game for 3 – 10 players based on games such as Mafia and The Werewolves of Miller’s Hollow with no moderator and no player elimination. A single game takes less than 10 minutes and requires very little setup. One of the primary reasons I use it as an introductory game is its excellent free mobile app which allows someone’s phone to take over the role of the announcer. The app, voiced by Dice Tower’s Eric Summerer, keeps the game flowing and clearly describes each role’s powers each night. New players don’t need to memorise anything as the app lets them know exactly what to do if you need to do something during the night phase. It’s quick to set up play, quick to play and lots of fun. People will want to play it again and again! However, as listening to the mobile app is very important, this game isn’t really suited to a loud environment such as a busy pub. Love Letter is a 2 – 4 player card game which was published by AEG in 2012. Each game takes around 10 minutes and required hardly any setup. The game comes in a small red (possibly) velvet bag which makes by far the easiest game of the three to transport around. In fact, I always have a copy of this game with me in case the opportunity to introduce people to tabletop games appears. The aim of Love Letter is simple, you must successfully court the princess. As the princess is not seeing suitors, you must entrust your letter to someone else and hope that they are able to get it to the Princess. You are also trying to arrange the interception of your rival’s letters, which can often be just as satisfying as winning the round itself. The game consists of a total of only 16 cards. 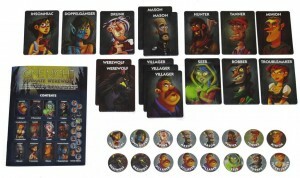 At the start of the game these cards are shuffled and a card is dealt to each player. A number of cards are then set aside face down (based on the number of players) which makes it impossible for players to figure out what you might have in your hand for certain. The player who was last on a date goes first, (something which can lead to some very awkward conversations.) On a player’s turn they draw a new card from the deck and then discard one of the two cards they now have. At the end of the round (when the deck is empty) the player with the card of highest rank wins. Therefore, in general, players will discard the card of lower rank on their turns. Every card has an ability which occurs once they are discarded. When a player discards a card they place it in front of themselves. It is now visible to everyone else. This allows each player to estimate which cards the other players may have in hand and to make better and better estimates as the game progresses. The player with the highest rank card at the end of the round gains an affection token. Once a player gain enough affections tokens, again determined by the number of players in the game, that player wins. 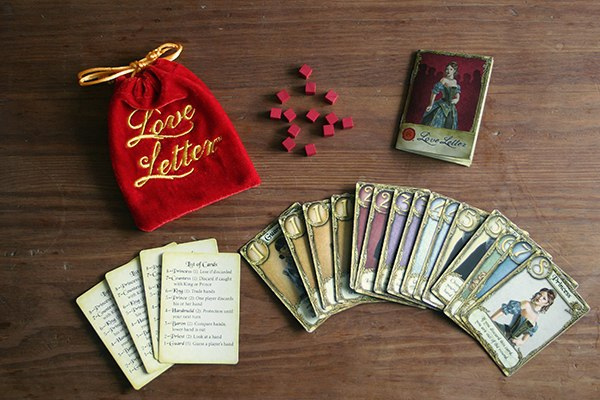 The rules for Love Letter are more complicated than the other two games on this list. Nevertheless, as players are limited to playing only one of two cards on their turn, it is still easy to teach and new players aren’t usually intimidated by the rules. Of all the games in this list this is the game I have played the most with new players. I have played this at weddings, Christmas parties and at various family outings. Love Letter was very successful and it has been reskinned multiple times since it was first released. If you are worried that your friends may be turned off by the theme then you can one of these (mostly identical) reskins such as Batman Love Letter, Munchkin Loot Letter or Adventure Time Love Letter.